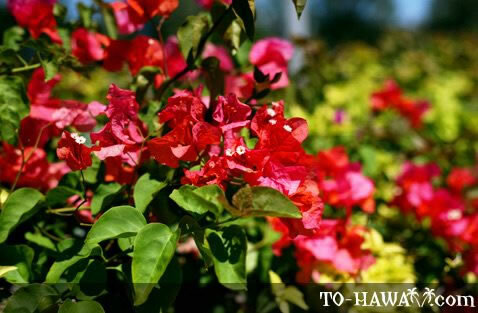 Bougainvillea grow well in a hot and dry climate. They are native to Brazil. In Hawaii, they can be seen in many leeward coast communities. The leeward coasts of all Hawaiian islands are the sunniest and driest areas. Bougainvillea don't need much water and love sunny weather. Their flowers are red, purple and orange in color. A rare variety has white flowers. The plant has thorns, so they should be handled with care.